Want to know a secret? I want to tell you something before you take the time to read this. It’s not something everyone knows and it’s important for you to know. What is the secret? Most doctors already have a great reputation. But they don’t have the time or knowledge to keep up with the ever changing world of online reviews. It’s 2017, yet adoption of online reputation management strategies amongst doctors and other healthcare providers is scattered. For every progressive doctor actively managing their online reputation, there seem to be dozens more who are not. If you’re reading this, it’s likely that you find yourself in one of these two categories. You’re already managing your online reputation and you want to make sure you’re up-to-date on the latest strategies and trends. Or, you’re seeing the growing influence of doctor review websites on the patient decision-making process and have been slow to respond. The following guide to online reputation management for doctors should arm you with the knowledge required to take control of your online reputation regardless of where you are starting out. In this guide, we’ll explore the concept of online reputation management. We will then dive into the trends driving the increased importance of reputation management and the benefits it offers for your practice. We will uncover the best online reputation management strategies and, finally, how you can implement an effective, ongoing online reputation management campaign. The goal of this guide is to eliminate any doubt (or fear) that you may have about successfully taking ownership of your practice’s online presence. The following information is presented based on almost a decade of experience managing the online reputation for dozens of practices, a few hospitals, and hundreds of doctors across the US. It’s also based on my perspective from as a part of the Google Local Guide program, which supports individuals who rate and review businesses on Google. This first hand experience is matched with extensive research and study of the trends influencing online reputation management, as demonstrated by the facts and figures you’ll find throughout the guide. For doctors, what exactly does it mean when marketers and others say online reputation management? While you may have been exposed to the term through advertisements, marketing, and stories, there’s often a lot of confusion amongst doctors, dentists, and other healthcare providers as to what online reputation management really means. Let’s start our exploration of online reputation management with a working definition and overview of what exactly it encompasses. At RepCheckup, we define online reputation management as a set of strategies and tactics used to ensure that your practice is seen in a positive light by patients (and their caregivers) researching you or looking for care online. The goal of online reputation management is to make sure that the offline realities of the great care you’re providing offline are properly reflected online. You can think of online reputation as one part branding, one part public relations, and one part patient experience. An effective online reputation management campaign comprises three main components: Online review solicitation; asking patients face-to-face for a review or via automated messages for a review of the practice. Online review monitoring; consistently checking ratings and reviews on common doctor review websites manually, or using automated monitoring software. Online review management; responding to both positive and negatives from patients. Of course, online reputation management also requires monthly review of your ratings and review trends. Remember, online reputation management is not marketing fluff: you gain valuable insights that help with patient experience and better care. Eventually, with advances in artificial intelligence and machine learning, you’ll be able to learn even more about how you can improve the patient experience and outcomes that your practice produces. The proliferation of third-party healthcare websites, including numerous sites dedicated to reviewing providers and their practices, opens up patients to a wealth of new information once restricted only to conversations with their family, friends, and doctor. Chances are they’ll know more about you than you know about them when they arrive in your office. Why’s that? Patients today can go comparison shopping online for a healthcare provider, just like they do for a hotel or restaurant. In fact, there are over 50 popular healthcare-related websites that show information about specific health care providers and practices. The consumerization of healthcare is quickly turning find your next provider of care into the equivalent of a trip down the cereal aisle at the supermarket. Millennials are already plugged into online discussions of their health care experiences. Even if they’re not yet your target demographic, they’re sure to pull through with their preference for online interactions as they age – including their loving embrace and dependance upon online ratings and reviews to make their decisions. Millennials are not the only ones that have embraced health care online. In fact, patients of all ages are embracing the internet as their go-to source for health information. Wait until you see how widespread the internet is being consulted. According to Pew Internet, 80% of all US adults have gone online to research health information, with 25% of those searches about a particular provider. Online, what patients see is what they know of you and your practice. It’s your job to ensure that the offline realities of your practice are accurately represented online. Even if your practice relies primarily on referrals and word of mouth, chances are high that a patient or primary caretaker will head online to research you before reaching out. Their first step? Pull out their phone, open a search engine like Google, type in your name, and hit enter. Or, perhaps they head over to Facebook and ask their friends for a recommendation, generating a flurry of first hand experiences, linked directly to a particular provider’s Facebook page. Maybe they fire up the Yelp app on their phone and look up what others have said about you. Today, this is the reality for patients. It’s also now yours. Owning (and protecting) your online reputation, however, is not just about ratings and reviews. Many healthcare websites have created provider directories that list you and your practice – often with inaccurate or missing information. This could lead to patients heading to the wrong clinic, calling the wrong provider, OR, worse yet, deciding not to call you at all. Today, managing your healthcare practice’s online presence is no longer something that is nice to have – it has to be a critical part of your operations because it heavily influences a patient’s decision to choose your for their care. The mega-trend behind the growing influence of rating and reviews on the patient decision making process has been well studied in recent years. This isn’t just one independent study or patient poll. There’s a rich amount of data available pointing to the influence that ratings and reviews play in the patient decision making process. It’s not exactly a secret either. Afterall, 85% of doctors say that they proactively check online reviews about themselves. The smart doctor and practice manager know that their patients are online and that reviews affect the business of medicine. Despite all of this, online reviews are still in their infancy. As time goes on, online reviews from patients will only have a greater impact on your practice – especially for referred patients and those looking for a new provider. Bedside manner, patient word of mouth, and reputation among your colleagues all factor into your medical practice’s growth. Building the career, business, and practice you want has always meant building and maintaining a positive reputation. Reputation management has always been vital for healthcare professionals. Patients talk. They always have, and they always will. If your patient’s love the care and the personal attention you provide, you can bet their friends and family are going to hear about it — and if they have a negative experience, they’ll be talking about that, too. These days, though, many of those conversations will happen on social media instead of in person, with more than a third of people in the US saying they already use social media to gather healthcare information. Today’s patients also go a whole lot further than simply asking their friends for doctor recommendations. Those recommendations are just starting points for the research patients do via search engines and healthcare-oriented websites. Before they contact your office, they’re likely to look for other reviewsto learn more about your background and your medical practice, and to see if your online profiles provide a sense of transparency that help build trust. An online reputation that helps build trust will help you acquire more patients, plain and simple. It makes perfect sense, too, whether you’re selecting a doctor, a restaurant, or an auto mechanic. Given the choice of three providers, all recommended by friends or someone else you trust, would you choose the one with a shaky online reputation, the one with limited online presence, or the one with plenty of available information and outstanding reviews? For healthcare professionals, ensuring you have a strong profile with positive ratings on sites like Facebook, Google, Healthgrades, Vitals, and Yelp are major reinforcements when it comes to patient referrals. Ensuring that your profiles and your reputation on these sites reflects how you want patients to view you and your practice is now an essential part of modern patient acquisition. The benefits of actively managing your online reputation don’t end with ensuring you get the referred patient into your office. Not only are you more likely to compare favorably to other doctors with a strong online reputation, but you’re more likely to be found in the first place if you have high ratings. Why? Well, Google and other search engines read the web just like patients. Okay, not just like patients, but they use a set of algorithms to determine which doctor offices and specialists patients see when they’re searching for care. Those algorithms examine the same things patients often examine—how far away from the patient’s location is your office, is your online profile accurate and complete, and even whether you or not your office is open at the time of the search. Search engines also value patient reviews more today than ever before. Google ramped up its focus on local ratings and reviews starting in 2013 when it launched “City Experts,” a program designed to incentivize participants to rate and review business on Google. Further, many search engine optimization experts believe that increasing the total number of reviews on your Google My Business profile results in improved search rankings. Physician referred patients, still the lifeblood of every private practice, are also increasingly influenced by online referrals. Thanks to the continual rise in insurance plans that require patients to select an “in-network” doctor, the next step a patient takes after they figure out “who’s on my plan” is to research and review what can be found online about these doctors. There’s even anecdotal evidence to suggest that even physicians consult the internet when looking to send a patient to a specialist in the area. I’ve heard accounts from doctors and their staff that referring physicians and groups had found them through a Google search, liked what they saw, and so decided to reach out and see if they could provide a service. While this may not be the norm, it’s worth noting, given the important role referrals likely play in your practice. The lesson here is that claiming your online presence has a number of benefits. Proactively managing your online reputation not only ensures you have a better chance of acquiring new patients when they look you up, it also means you have a better chance of patients learning about you when they don’t have a referral. As a healthcare provider, there are several websites you should be aware of when it comes to your online reputation. These are the websites that patients and caregivers are most likely to find online with information about you and your practice whilethey’re doing research. Sure, patients may not visit them all, but none of them can be ignored. Healthgrades is a website that allows patients to search for medical providers or hospitals to receive care. It’s also the largest and most widely used doctor review website – in 2013, Healthgrades was the first stop for 43 percent of patients searching for providers, according to the Software Advice survey. Practices can create free profiles on Healthgrades that patients can search for when looking for a provider. After their visit, patients can then rate the provider on Healthgrades based on their care and leave a review. When a patient searches for a provider, the provider with the best reviews and ratings is often listed at the top of the search. Since it’s the number one site with patients, Healthgrades should be a top priority for your online reputation strategy. Vitals is the second most popular healthcare provider review website. Additionally, Software Advice found that almost a fifth of patients who use Vitals do so to search for reviews of a specific medical provider. A major difference between Vitals and other popular websites is that Vitals also allows patients to compare the cost of one provider or procedure to other similar options. Vitals calls itself “the most robust and accurate provider database” and claims that it has 90 million members. With such a large number of users, it’s clear that your Vitals profile is important to monitor. RateMDs is another healthcare provider review website, similar to Healthgrades and Vitals. On RateMDs, patients can rate a doctor for knowledge, punctuality, staff, and helpfulness, as well as leave reviews based on their experience. While not as large as Healthgrades or Vitals, about 24%t of patients in the Software Advice survey said that RateMDs was their most trusted source of physician reviews. This is enough usage to convince any provider of the need to pay attention to his or her practice’s profile on RateMDs. You’ve probably already heard of WebMD, the health and medical resource website that gets over 145 million visits per month. WebMD is pervasive online, it’s often cited by patients as their de facto source for information on their care. What you may not know is that WebMD also has a robust provider directory that features information about individual physicians. Given that WebMD is the largest medical and health information website on the internet, it’s a no-brainer that you should claim and optimize your profile. The WebMD directory is not just a listing – it also features ratings and reviews from patients, making it an important profile and part of your reputation management efforts. MD.com has a long legacy in the doctor review space. It was one of the first doctor review websites and over the past decade has grown into more than that. They now provide telehealth services for both patients and providers through their own mobile app. MD.com might have changed its focus over the years, but it has never dropped the ability for patients to leave reviews of providers with profiles on the website. It may have taken a backseat with their recent evolution, but with 10’s of thousands of existing profiles on their website, you could already be one of them. CareDash is a new venture capital backed startup that’s taking new approaches to patient reviews as it seeks its seat at the table with behemoths like Healthgrades and Vitals. What sets CareDash apart is that they’re focused on furthering transparency in the review process, working to deliver better data, and insights to patients and providers. With a focus on helping the growing number of patients that value user experience and transparency in healthcare, CareDash is rapidly becoming a go-to starting point for patients in search of a new provider. Today, when a patient conducts a Google search for your specialty, the results they see are powered in part by Google My Business. It’s not just searches for your specialty that will pull up your profile; when a patient searches your name, Google displays information from your Google My Business profile on the right-hand side of the results page. Many marketers focus on Google My Business for its SEO value, but patients can also see reviews left by other patients when they search. These include reviews left directly on your Google My Business profile and also aggregated reviews from other websites, such as Facebook and Healthgrades. Out of all the medical provider review sites, Google My Business reviews may be the most important to manage, as a large majority of patients go to Google first when looking for a provider. It’s important for healthcare providers to carefully manage and monitor their Facebook pages because, like Google, Facebook reviews are highly visible – after all, most patients will have their own Facebook profiles. Many patients are also starting to send private messages requesting appointments, something that would be missed by a provider not monitoring his or her profile. Be careful not to use your personal page as your business page on Facebook. Instead, create a page specifically for your practice so patients aren’t seeing your personal posts along with your professional content. Yelp, best known for restaurant and retailer reviews, also has a section for healthcare reviews that is heavily used by patients. Patients leave reviews based on their satisfaction with you as the provider, your staff, and the care they receive. You know, they Yelp. Like Facebook and Google, and because Yelp is such a large review website, it’s critically important for healthcare providers to monitor their practices’ Yelp profiles. By now you should understand that online reputation management is important for doctors and practices. In fact, I’d argue that properly managing the online reputation of your practice will be the cornerstone of its growth for decades. Now that you know exactly what online reputation management for doctors means, the impact doctor ratings and reviews have on the patient decision-making process, and which doctor rating and review websites patients are using the most, it’s time to talk about implementing an online reputation management strategy. Getting started with the online reputation management strategy for your practice shouldn’t require you to try and experiment or reinvent the wheel. Having implemented numerous online reputation management campaigns and programs for doctors, I’ve developed a simple blueprint that you can use. Here are my five steps you should take to take to have the best online reputation management strategy for your practice. Putting a specific point-person in charge of your online reputation management will ensure that your strategy gets executed. If you’re a sole practitioner or doing this on your own dime, maybe that’s you. If you have the luxury of staff, giving this responsibility to staff will free up your time, ensuring your strategy gets implemented. Whatever situation you may be in, always remember, the best strategy is the one that actually gets implemented. You can’t improve your Healthgrades profile or increase Google reviews without action! There are dozens of sites out there that patients use to find, evaluate, and contact physicians, and a few like HealthGrades, Vitals and Google My Business are essential for managing your online reputation. There are even more business-listing sites, such as SuperPages and an array of other healthcare-related third-party websites. If you’re actively practicing, chances are you have a profile on these sites whether or not you know it. The first step in online reputation management is claiming your profile on all of the “find a doctor” and business-listing sites, many of which we covered previously. If you don’t claim your profiles with these websites, you won’t have any say in what’s presented.Remember that, often times, what is posted by default also happens to be inaccurate. Taking control of your profiles will instantly give you more control over your online reputation. Now that your profiles are claimed, you need to make sure they are enhanced and optimized, so you get the maximum benefits from them. To start, make sure you have updated images, accurate information about your office’s services, treatments, location, hours, payment methods, contact info, and any other important details. Note that you should update your profiles any time there’s a change. You can find, claim, and update your profiles manually if you want, but there are software options that can make it much easier, such as RepCheckup. With literally hundreds of different places on the web where you might be listed, online reputation management software can be a major time and cost-saver in the long run. Your waiting room area(s) should have tasteful signage or other collateral reminding patients that what they say online truly matters to your business. For example, Dr. Brian Zelasko lets patients know where they can place reviews and join discussions. These gestures show patients that sharing their positive experiences online will actually help you make the practice better. Of course, this practice encourages patients to speak to you, or someone in your office, immediately if they have a negative experience — those are actually great opportunity to turn a disgruntled patient into a lifelong evangelist). Don’t stop with in-office signage, since after a patient walks out of your office, they’re highly unlikely to spend the time to give you a positive review online. You can combat this reality by implementing online reputation management software such as RepCheckup that automates following up with patients to make sure they were pleased with the service they received, and to encourage them to share their experiences online. A text message or email a day or two after a visit to your office with a reminder to rate you on Google or HealthGrades, will increase the number of positive review you will have online, where it matters most to you and your practice. For example, Dr. Ava Shamban increased the number of positive 5 star reviews on her Google My Business profile by over 50% in first month she used RepCheckup, without her having to spend any time directly soliciting the her patients. Online reputation management software can save you a tremendous amount of time when it comes to monitoring your online profiles. Using software such as RepCheckup, you get around-the-clock monitoring for new reviews, with instant notifications sent anytime someone leaves a rating or review. This gives you the opportunity to quickly respond to any feedback – positive or negative. Again, you can’t control the information that’s posted about you online. However, by continually monitoring your rating and review website profiles, you can keep a pulse on what’s being said about you and be in a position ready to react should a truly negative review be posted. While online reputation management software can help increase the number of reviews you have and decrease the time you spend monitoring your online profiles, you still need to respond to the reviews patients leave for you online. And yes, this includes both positive and negative reviews. In order to speed up the process and make things easier, you should spend time creating a number of canned online review responses that can be used by anyone at the office to respond on your behalf (or the practice’s). Keep in mind that the point of this step isn’t to simply cut and paste the same canned response, but to act as basic templates that can be tweaked for each individual review. It’s true that most patients will see your online reviews before they get to your website. That’s not enough, especially if you’ve got glowing online reviews. Given the amount of trust most patients put in online reviews, you should take advantage of this opportunity. The best way is to prominently display your online reviews is directly on your website. 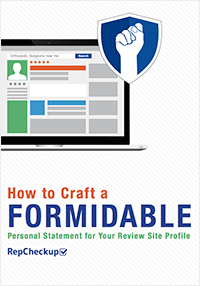 The most straight-forward way to execute on this is to create an entire page dedicated entirely to your online reviews. You should also include your ratings and review scores on bio pages and even on your homepage, if the design allows for it. Remember, online reviews that no one sees are no good! Similarly to featuring your online reviews on your website, you should amplify the visibility of your positive online reviews by promoting them through social media. This could be in the form of a simple link to the original review left on one of your profiles. Or you could take it as far as to create a video that loops through a number of positive reviews left from you around the internet. Finally, don’t forget about the patient rating and review data that’s not generated online. The internal patient survey data you collect can also play a part in your online reputation. It’s another way to use patient ratings and reviews to better reflect the offline reality, online. If you are in practice long enough, you’re going to get a negative review from a patient. No healthcare provider is perfect. No patient is perfect, either. Not to mention your office staff. We’re all human. We have bad days, make mistakes, and cause stress for others more often than we’d like to admit. When you, your staff, or your patients inevitably have a bad day, make a mistake, or miss the mark, the result is usually a negative review. No one likes to be told they didn’t do a great job. Or that their customer, the patient, is disappointed, unhappy, or systematically trying to tear down your good name online. While the toxic spew building at the back of your throat after reading a negative review may feel good to release, it’ll do little to help and will actually hurt you far more than you could ever imagine. Responding to negative patient reviews on doctor review websites takes more than just emotional control – it requires accountability, empathy and action. Here’s how the best healthcare providers handle responding to negative reviews when they occur. 1. Own the Online Rating or Review! Whether the patient has a valid reason for leaving a complaint or not, it should have no bearing on the way you should handle it. The fact is, the review is tied to your name, and that makes it yours. Ignoring it will be of no benefit to you. If you get a new review – any kind of review – it is your duty to respond to and address it. Yes, you should even publicly thank those patients who leave a positive review. Notice that I said “Own it” not “Fight it” or “Deny it.” Publicly expressing empathy for the patient’s experience with your practice goes a long way – both with the upset patients and others who may come next and see the review. Maybe the reason why the patient is upset has little (or nothing) to do with you , but you want to acknowledge the fact that they don’t feel they got the best treatment. You want to reiterate that you strive to provide high quality care and delight patients with a great patient experience. Mistakes do happen and no one is perfect. Letting the patient know they’ve been heard and you want to use this as a way to get better, creates a bridge that usually results in the review being taken down by the patient. In many cases, I’ve even seen the rating or review updated to more positively reflect the patient’s new experience. No one wins when you fight with a patient online. As annoying and infuriating as negative reviews can be, you have to remain calm and remove your emotions from the situation. Otherwise, you run the risk of alienating a patient and hundreds of others who may catch your public fist-a-cuffs. If there is something that needs to be addressed, it needs to be done in private. If you are trying to get more details about what went wrong (in the eyes of the patient) during their visit, the appropriate way to do that is by contacting the person through a direct message to them. Remember, HIPAA applies when speaking with patients in public. Never reveal their personal health information. Never, ever, ever. Don’t do it! You know better than I do what happens when someone leaves a wound untreated. It festers and gets worse. Sometimes, it could be deadly. Don’t let a negative review get worse, turn into more negatives on other profiles, or kill the good name of your practice. Once you are aware of the problem, do everything you can to make it right. During personal outreach to your patient, you may feel it’s appropriate to make an offer to them in an effort to repair the damage they feel was done. By making it right, you will have the best chance of your patient removing or amending the negative review. In many cases, when a wrong has been made right, the end result is more positive than if the review had started positively! More often than not, patient complaints have less to do with outcomes and more to do with the patient’s experience. Office staff, insurance fiascos, and poor bedside manner are the most frequently cited reasons for patients leaving negative or poor reviews for healthcare providers and practices. These are all people problems that can be fixed through better processes, procedures, and consistent coaching. As healthcare continues to change, practices with the best patient experiences will be able to differentiate themselves from competitors, earn more and spend less time fighting with patients online. Use your patient feedback and patient reviews online to guide and make positive improvements in your practice! Negative patient reviews are not going anywhere. It’s one weapon every patient knows they have in their arsenal should they need to go to war. Even the best healthcare providers in the world get negative reviews and, in reality, are powerless to do much other than own it, fix it, and prevent the same issue from happening again. While advances in software and tools such as RepCheckup make it easier to manage your professional reputation, monitor review profiles, and handle negative reviews, they still need to be handled with great care when they do happen. Armed with all of this new knowledge about the importance of online reputation management, it’s now time to take the next step and implement an online reputation management program at your practice. If you’re ready to take control of your practice’s online reputation, here’s a checklist of items to complete to get you heading in the right direction.